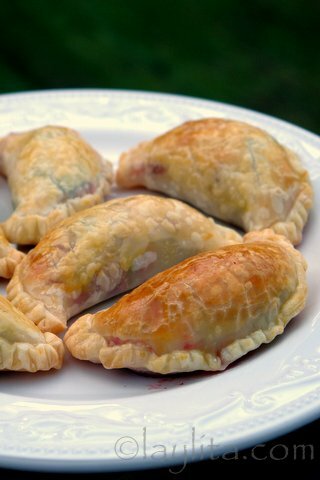 These Swiss chard, beet and goat cheese empanadas, or empanadas de acelga, remolacha y queso de cabra, are the result of over shopping at the Farmers’ Market, and a successful kitchen experiment. 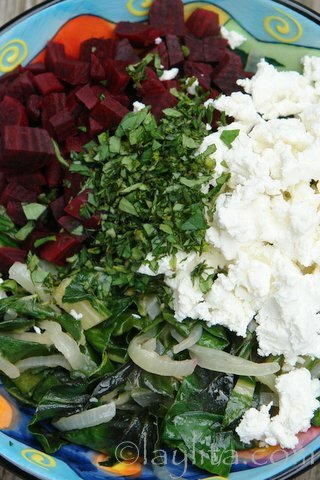 I was thinking that Swiss chard and goat cheese would go well together in a pasta dish or maybe a pizza. It just happened that I forgot that I also bought a bunch of beets at the same stand where I got the Swiss chard. When I unpacked the ingredients, I thought about what to make with the beets, and decided to add them to whatever I ended up cooking, which turned out be these vegetarian empanadas. 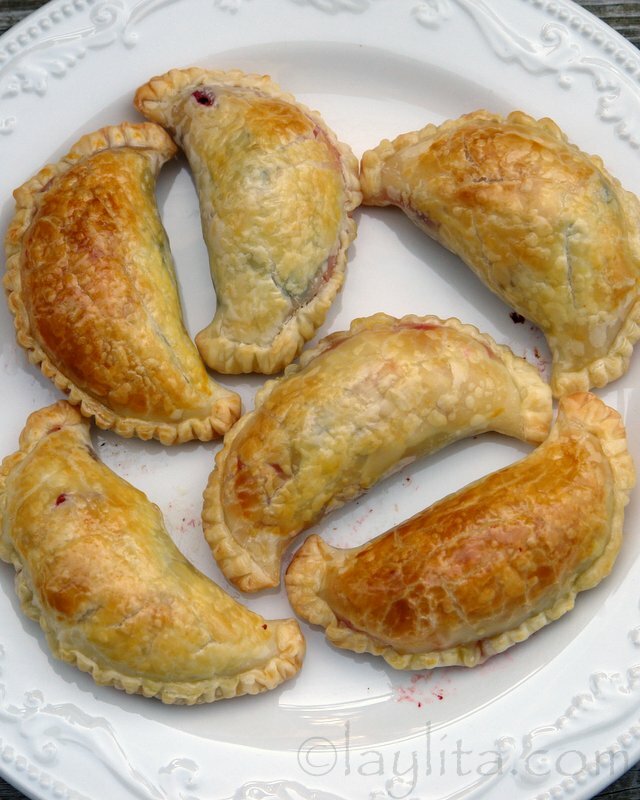 Easy recipe for vegetarian empanadas or hand pies filled with chard, beets, goat cheese and oregano. Heat the oil and sauté the onions and garlic for 3 minutes. Add the chopped Swiss chard and cook for about 5 minutes, stirring occasionally. Remove from the heat, cool down and mix with the diced beets, crumbled goat cheese and chopped oregano. To assemble the empanadas spoon the stuffing on to the center of each empanada disc. Brush the inside edges of the empanada discs with the egg whites, this is will help them seal better and keep the filling from leaking while baking. Serve warm with the mint crème fraiche sauce. I have to admit that I was somewhat skeptical about these when I was making them. I thought the stuffing tasted good but still wasn’t sure how they were going to turn out. I tasted them when they were done baking and liked them, but wondered if anyone else would (I usually like to eat everything I taste).So I took one to Nicolas and he loved it. Then I remembered that I had some leftover minty crème fraiche sauce that I made earlier. 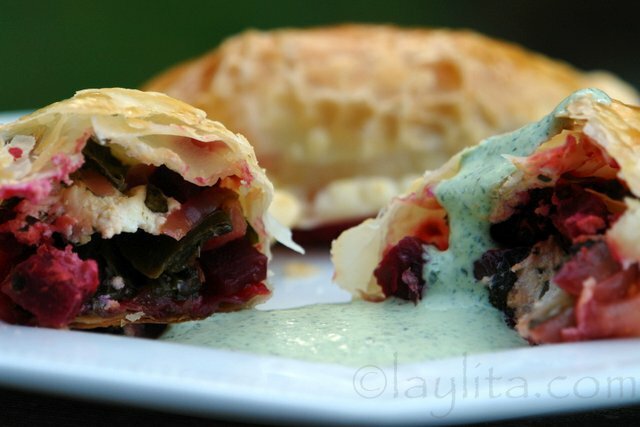 I tasted a piece of these Swiss chard, beet and goat cheese empanadas with the creamy herb sauce and it was just perfect. These empanadas were really easy to make, especially since I cheated and used the store bough empanada discs. Next time I will try them with homemade empanada dough. If you buy beets that have the greens included, you could also use the beet greens in place of the Swiss chard – to be extra efficient with your use of ingredients. 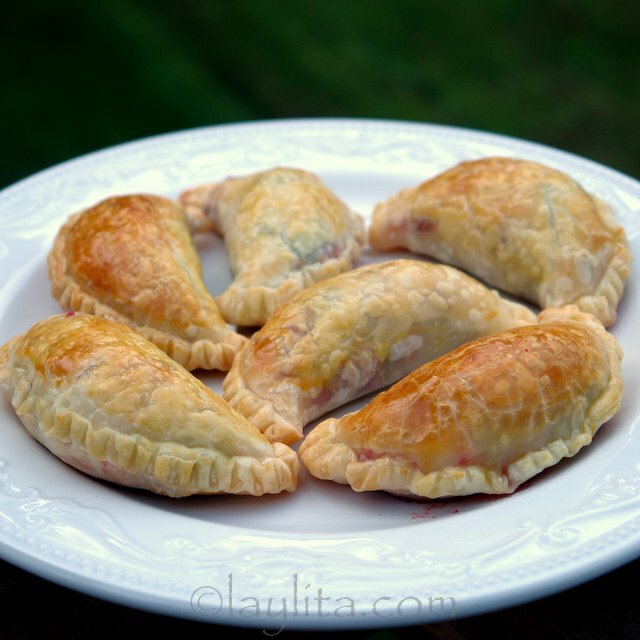 I would like to try a vegetable empanada without cheese (allergic to dairy). is there an alternative? would an egg bind the ingredients together? Hi Nancy – The filling doesn’t have to be bound together, you can use any mix of veggies that you regularly like together and it will work fine. I made these for a tapas party – they were delicious! A big hit with everyone! Thanks for the inspiration! I just love what you doing,I made some of your recipese, absolute fantastic!!! WOW Laylita, I stumbled upon your site by accident and am just delighted by my detour. Just FYI, I am a guy who has no business in the kitchen unless Hamburger Helper is on the menu. Neverthless, as a guy in the doghouse who owed his wife a surprise homecooked meal, I made these empanadas and they turned out great! My wife was amazed, and too be honest, I was quite shocked at how much I liked them too (considering I made them)! I am glad I stumbled onto this site, as the first group came out so well, I think I am going to surprise her with one of your other empanada recipes this weekend. Thanks for the great ideas and the easy-to-follow instructions on how to make these…cheers! Hi Bryan – Glad you liked them, they were a pleasant surprise for us the first time I made them! Hi Bob – thank you for visiting. I agree completely on the frozen empanada discs, they are very good quality and make the whole process of making empanadas so much easier. Great Blog!!!!!!!!!!! I love the presentation of the food and the recipes. I just wanted to say for those who don’t have time to make the dough you can get pre-made empanada discs at most Latino markets. There is an Argentine brand called La Salteña and it is excellent. They have two kinds, one for frying (I am not a fan of frying) and one for baking. Ask for the baking empanada discs. Many times these discs (La Salteña and others) are frozen but don’t let that scare you, they hold really well and taste great. Again, I love the blog and keep the recipes coming. OMG-these look so good! We will have to use them in next month’s Empanada of the Month event! Layla-your blog is a treasure!